Three episodes into Making a Murderer, I quickly realized the docuseries—as groundbreaking and well-intentioned as it was—would provide no closure. So I gave up. When it comes to true crime, I want an ending. Whether or not you agree with its implications, the trial of OJ Simpson has one—and the first few episodes of FX’s new series American Crime Story: The People Vs. OJ Simpson send their viewers hurtling towards it in some of the most magnetic television I’ve seen in some time. Like most Americans alive during Simpson’s 10-month trial, I remember it. Not well—I wasn’t old enough to fully comprehend the details—but the bullet points are all there. Chilling in the 1995 folder of my brain along Little League games and Babe are images of a beloved ex-football player, a dead ex-wife, a car chase, roughly a billion lawyers, a glove, and an acquittal. Though Ryan Murphy’s new series assumes you’re familiar with the basics, it would be thrilling even if you weren’t. Everything I didn’t know shocked me, but so did everything I already did. From the moment we see the dead bodies of Nicole Brown Simpson and Ron Goldman, creator Ryan Murphy fills the screen with a version of mid-’90s LA that exists somewhere between campy re-enactment and documentary. The camera spins and zips throughout a city gripped by both the OJ story and all too familiar instances of racially motivated police violence, giving us a world that feels both theatrical and precisely like our own. Murphy, bless his horror-loving heart, can really send a narrative off the deep end when he’s controlling it himself, so the fact that ACS was written by other people (and is based on true events) allows him to focus on two things he does wonderfully: dramatic flair and casting. There is not a scene in the season’s first three episodes that does not dare you to take your eyes off it—and as each new character is introduced and quickly defined, why would you want to? This is as good a cast as you’ll find on television—from Murphy standbys like Sarah Paulson and Connie Britton to film stars like John Travolta and Cuba Gooding Jr.—and they’re performing in one of its best playhouses. But at the center of it all is Cuba Gooding Jr.’s performance as OJ Simpson. His version of Juice is both startling and pathetic, particularly in the second episode, “The Run of His Life,” during which he shows up on every TV in the country while threatening suicide in the backseat of Al Cowlings’s (Malcolm Jamal Warner) white Ford Bronco. After years of irregular (and perhaps regrettable) choices, it’s nice to see Gooding doing great work again. Maybe all it took was a cast and creative team comprised entirely of people doing great work of their own. It’s odd, being thrilled by the aftermath of a tragedy. Odder still that the thrills remain despite knowing what’s coming. 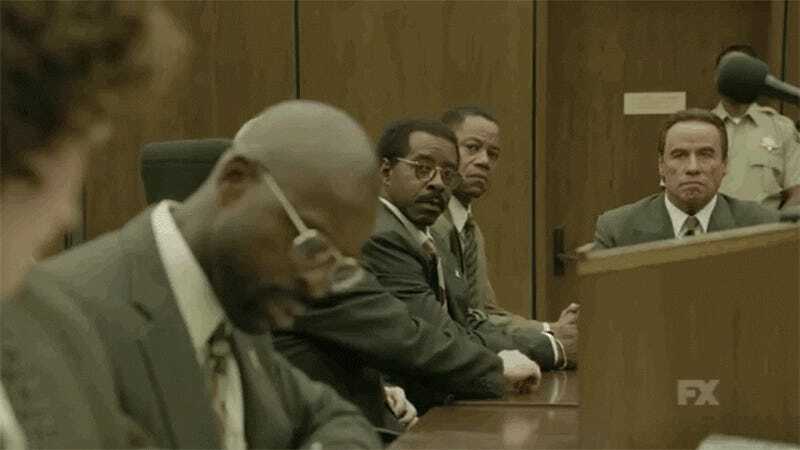 But American Crime Story: The People Vs OJ Simpson is as exhilarating as it is thoughtful. And I can’t wait to see how it ends. For the second time.